You know how we talk about worst case scenario of climate change impacts? Well, it's happening now in some Pacific islands. All across the Pacific, high temperatures have been recorded and residents reported the hottest months they have ever experienced. For some islands however, the impacts have gone beyond a daily nuisance to a serious marine threat. Last week reports from Vanuatu and Fiji showed fish kills by the thousands as a result of the temperatures. 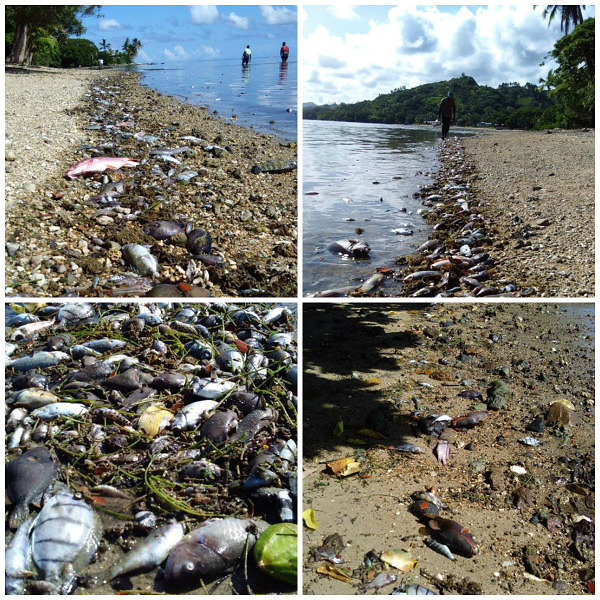 Lice Movono-Rova of Newswire Fiji reported thousands of dead fish washed up on the shores of Coral Coast in Fiji. The pictures taken by Victor Bonito, a marine ecologist in Fiji show a beach scattered with dead fish. The same reports were also received from Vanuatu who have reported unprecedented high temperatures which also lead to fish kills in some parts of Vanuatu. Bonito, a marine ecologist for Reef Explorer Fiji attributed the fish kill to high temperatures. "This is the worst thermal (heat) stress event I've witnessed on Coral Coast reefs during the 10 years I've lived here," he said. Bonito who has been monitoring the water temperature said Reef Explorer Fiji has equipment in the water to measure water temperature, and confirms 5 degrees Celsius higher than normal in the area. He said the water has been peaking around 35, 35 degrees out on the reef flats with sea temperature is around 30 degrees. In Vanuatu, the Vanuatu Daily Post reported hundreds of dead reef fish that included octopuses and crabs were found floating in the water and washed up in three locations across the islands. The Department of Fisheries for Vanuatu on-site assessment registered a water surface temperature of 32 degrees Celcius during high tide which according to local Fisheries Officer Rocky Kaku, "would be much hotter during low tide." The National Oceanic and Atmospheric Administration (NOAA) recently published high sea surface temp anomalies (SSTA) across the Pacific including one in Fiji another high SSTA near Solomon's causing the tropical depression currently active in the area. At the Paris Climate Conference of the Parties in December 2015, an agreement was signed that would only come into effect in 2020, this simply is not good enough for islands who are already feeling the impacts of climate change. What we need in the Pacific are solutions to issues we face now, as we await international action, because the reality is, the food sources of islands like my own, Samoa, will be threatened first. A large number of Pacific islands still rely on subsistence activity for their livelihoods, with many relying on the ocean for their livelihoods. According to the Food and Agriculture Organization of the UN, agriculture, including the forestry and fisheries sectors, must adapt to the impacts of climate change and improve the resilience of food production systems in order to feed a growing population. That is why it must be addressed as an integral part of the overall development agenda. For our immediate household, all we really need right now, are fans, fans and more fans to deal with the heat.